I have tried hard not to give in to the urge to bake bread these days, as we are trying to lose the 5 Christmas pounds we both gained over the holidays. It's not that we don't eat bread-- we eat moderate amounts of DH's good mostly-wholewheat bread. But it's hard not to eat too much of it when you are faced with a crackly artisan loaf! 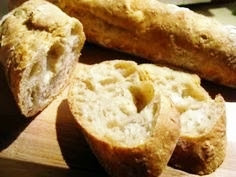 But, I gave in last week-- gave in to the urge to attempt to make a really good baguette. I decided to try a no-knead baguette and I used the recipe at the King Arthur Flour website as a starting point. 1.) I used 1 cup of wholewheat flour and the rest (7 cups) Canadian unbleached white flour . 2.) I used dry active baking yeast (the same amount-- 1 tablespoon) instead of instant yeast , and I used slightly warmer water (3 cups) and dissolved the yeast in it first. I used the same amount of table salt (1 tablespoon). 3.) I didn't knead the dough at all in a mixer, as the recipe had instructed-- I wanted to keep it simple, like my other artisan-style bread, so I just stirred the ingredients together in a large bowl, then let the dough rise, covered, for 2 hours (you can actually let these no-knead doughs rise in a coolish kitchen for up to 18 hours before refrigerating, if you like), and stored it in the refrigerator in a container with plenty of room to rise. 4.) I changed the baking method-- more about that further down. 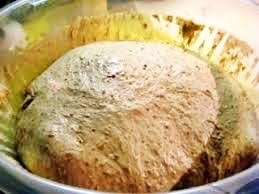 The dough (with 1/4 of it used already) after a few days in the refrigerator. The dough is drier than my own no-knead bread, but I figured, what the heck-- you aren't using alot of expensive ingredients in this bread! The recipe is a little confusing about how much it makes, but it does make 4 baguettes. I made one loaf up after about 3 days in the refrigerator, and I rested and shaped and rose the bread as per the recipe (there are pictures for shaping here). I rose and baked it in a parchment-lined dark baguette pan at 450 degrees F, as the recipe instructed. It turned out pretty good, crackly crust and moist inside, but not enough holes for me. 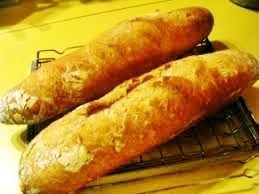 I made a batch of 2 baguettes last night and I tried something different with the baking. I shaped them as instructed and rose them inside of "troughs" made with heavy tea towels, lined with baking parchment (which I sprinkled with flour), instead of in the pans. I placed the shaped baguettes into the "troughs" with the seam-side-up this time, because what I wanted to try was heating the baguette pans in the oven first, along with a large rectangular roasting pan to use as a cover, and I'd have to turn the baguettes into the hot pan. I figured that this might create more of a "mini brick oven" atmosphere, as we do when baking round or oval loaves in a preheated covered pot. 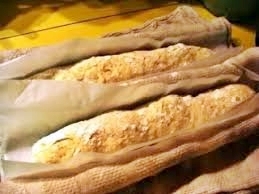 When the baguettes had risen in their "troughs" for 1 1/2 hours on my kitchen counter, I heated the oven, with the baguette pan and the roasting pan in the oven (to 475 degrees F this time) for half an hour, giving the loaves a full 2 hours to rise. 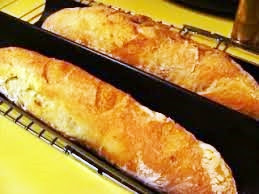 Then I removed the hot pans from the oven, sprinkled the baguette pan with a little flour, and up-ended the risen loaves carefully into the hot baguette pan "troughs", seam-side-down, using the parchment they rose in as a "carrier". It worked! I sprinkled the tops with a bit more flour, slashed the tops with a razor blade, sprayed them with warm water, and hurried them into the hot oven. Then I turned the hot roasting pan over the baguette pan to form a cover. The whole affair was not covered on the very ends because there is a handle on the baguette pan which was longer than the pan, but I figured mostly covered was possibly better than not covered at all! I set the timer for 25 minutes and left it alone, hoping for the best! After 25 minutes, I removed the cover-- they had risen beautifully! They were nicely browned on the bottom, but needed a little more browning on top, so I turned them over and let them bake, uncovered, for another 5 minutes before placing them on racks to cool. The crust was great-- you could hear it crackling as it cooled! When we finally cut into it (so hard to wait!) we were rewarded with a moist, holey interior and excellent flavor from the longer fermentation in the refrigerator. I have one loaf's worth of dough left-- maybe I'll make a few hard rolls with it! 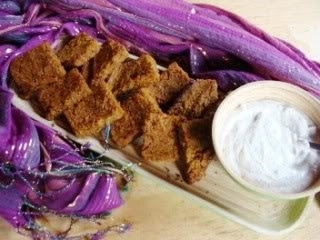 Give this a try-- so yummy, and so simple. 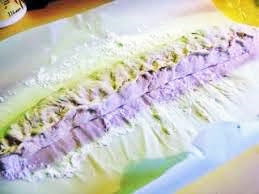 The absolute basic bread ingredients-- water, flour, yeast and salt-- turn into this wonderful creation with hardly any work. Really! 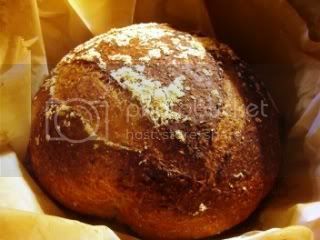 PS: Oh, and check out Yeastspotting, "a weekly showcase of yeasted baked goods and dishes with bread as a main ingredient." I just discovered it and there's alot of beautiful bread out there...whew! I've been wanting to try a pumpkin kibbeh for a long time, but never got around to it before now. 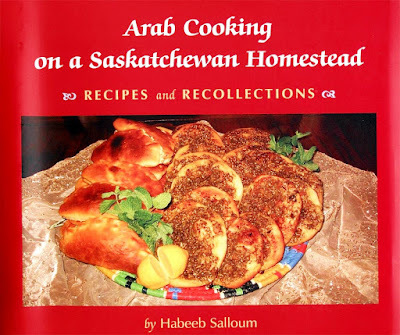 (Read about the Middle Eastern dish kibbeh at this blog post, along with a recipe for a delicious [but high-fat] potato/bulgur/onion kibbeh.) I had a can of pumpkin leftover from the holidays, so I decided to make kibbeh for lunch today. This version is adapted from a recipe by Canadian/Syrian author and scholar Habeeb Salloum from his excellent books "Arab Cooking on a Saskatchewan Homestead: Recipes and Recollections ", "Classic Vegetarian Cooking From The Middle East And North Africa ", and “From the Land of Figs and Olives ”. I used more onion and I sautéed it first to deepen the flavor. I used smoky Aleppo Pepper instead of cayenne . I cut the amount of allspice in half because I find that it can be rather overwhelming. I used chickpea flour instead of white flour, to add more fiber, protein and general nutrition. And I found no need to add water. I also added a tart, savory sauce to cut the sweetness of the pumpkin. The result is a tasty, make-ahead, low-fat, low-points meal (or appetizer, if served in smaller quantities) with lots of protein and fiber. I prefer this dish served at room temperature. Heat the 1 tablespoon olive oil in a nonstick skillet and, when hot, add the chopped onions and salt lightly. Saute briefly, then turn the heat down to medium-low and continue to cook until they are softened and just started to brown. MICROWAVE OPTION: Place the oil in a microwave safe dish, add the onions, salt lightly and toss to coat with oil. Cover and cook on High for 4 minutes (that's at 1200 watts-- slightly longer for less wattage). When the bulgur has absorbed most of the water, pour it into a fine strainer over a bowl and then squeeze handfuls of it as dry as you can. Place the squeezed bulgur in a medium bowl and discard the liquid. Mix the salt into the bulgur, distributing evenly. Place the cooked onion, pumpkin, garlic, coriander, pepper, allspice, cumin, cayenne (or Aleppo Pepper), and chickpea flour in a food processor and whirl until thoroughly blended. Scoop the processed mixture into the bulgur and mix well. Grease two 8-inch square pans , each with 1 teaspoon of olive oil. Scoop half of the mixture into each pan, and smooth the surface of each until level. Drizzle a teaspoon of olive oil over the top of each and spread it around gently and evenly with your fingertips. Place the pans under the broiler for a few minutes (watching carefully!) just to brown and crisp up the surface a bit. Remove the pans to a rack to cool. 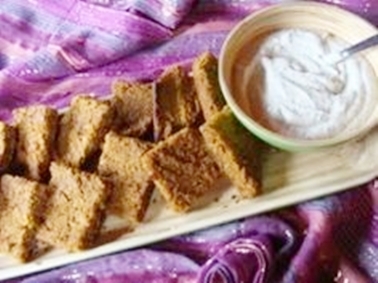 Cut the kibbeh into squares or triangles and serve at room temperature with the Tofu/Tahini Mint Sauce. blend all the ingredients until smooth. Scoop into a bowl, cover and refrigerate until serving time. Nutrition (per serving—includes sauce): 275.6 calories; 31% calories from fat; 9.8g total fat; 0.0mg cholesterol; 822.3mg sodium; 525.3mg potassium; 40.0g carbohydrates; 9.5g fiber; 6.1g sugar; 30.5g net carbs; 10.4g protein; 5.5 points. If you use home-cooked pumpkin or squash, bake it until it is tender and then scoop it out of the shell and puree it in a food processor. Drain it for several hours hanging in a cloth (tied with string) suspended by your kitchen tap over the sink, until it’s thick like canned pumpkin. FINALLY! 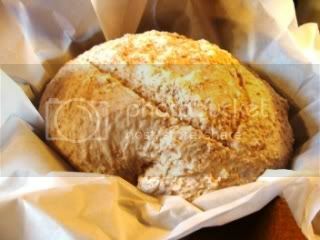 NO-KNEAD, CRUSTY ALMOST-ALL WHOLE WHEAT ARTISAN BREAD BAKED IN A POT! UPDATE: THIS DOUGH ALSO MAKES GREAT PIZZA! See the pizza photo at the end of this post. As with my other recipe, I borrowed ideas and advice from a number of experts (see the text at the beginning of the recipe below), combined with my own tastes and experience. I don't know if it is possible to make a really tempting whole wheat version of this type of bread solely with whole wheat flour. My early attempts were "grassy"-tasting and heavy. So, I used the proportions in Jeff Hertzberg's and Zoë François' recipe for "five-minute" no-knead, refrigerated for whole grain bread, with a few additions and changes. 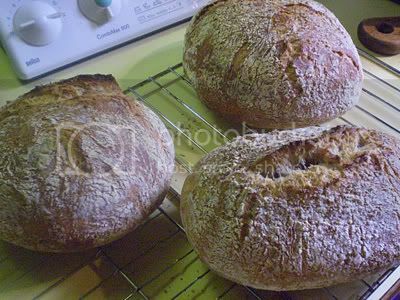 The proportions are slightly more than 3/4 whole wheat flour to slightly less than 1/4 unbleached white flour-- not bad! The authors explained that "In order to mix up dough that’s really high in whole grains, but can still be successfully stored, you need to boost the dough’s gluten level. Otherwise, the bread won’t rise nicely and will be too dense..." This made sense, even though I've always disliked the breads I'd tried with added gluten (they seemed to have a "tough" quality). But it worked with this very wet dough! I used a little less gluten this time, because it still seemed a bit tough the first time I tried it. However, this may be explained by the higher gluten content in Canadian flour, so you can try it both ways if you live in the USA. I hope you will give this a try and perhaps you can improve upon it further, and make your own variations. It's such an easy and satisfying way to make good bread! 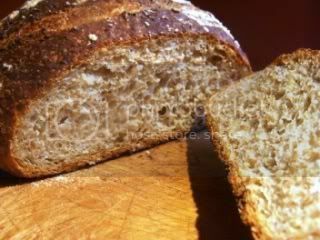 For this recipe, I have used as much wholewheat flour as possible and still kept the qualities of an artisan crusty bread-- a crackly crust, holes in the crumb, etc.. I started with Jeff Hertzberg's and Zoë François' recipe for "five- minute" no-knead, refrigerated dough for whole grain bread, combined with some of the qualities of Jim Lahey's no-knead bread method (via Marc Bittman in the NY Times), along with his novel pot-baking method; and took also advice from Peter Reinhart's books (reluctantly adding a little sugar to the whole grain dough, as he recommended, and finding that it improves the flavor of a mostly whole grain loaf), and Cook's Illustrated magazine experiments with no-knead, pot-baked bread. 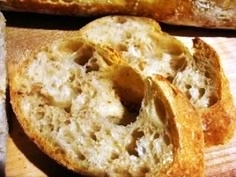 (See this blog post and this one for more about no-knead, crusty bread, and this one for my "whiter" version.) It's very good! In a large bowl or plastic container, mix the yeast into the lukewarm water (about 100 degrees). Let sit until yeast dissolves. (If using the instant yeast, you don't have to dissolve it, though master baker Peter Reinhart has revised his thinking on this and recommends dissolving instant yeast to "allow it to ferment more effectively during the cooldown phase in the refrigerator".) Add oil, sugar, and salt. 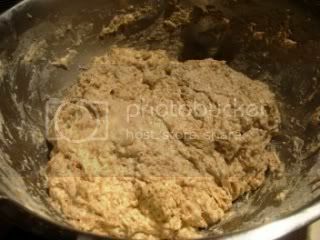 Stir in the flour mixture, mixing until there are no dry patches. Dough will be quite loose. 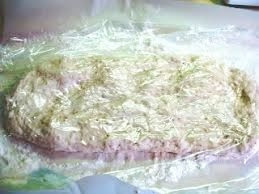 Place the container inside of a clean plastic bag (a small new white garbage bag does fine), and twist-tie it closed, leaving room for the dough to rise. Let dough rise at room temperature 2 hours (or up to 10 hours). When ready to bake, sprinkle a little flour on dough (DON'T PUNCH DOWN!) and cut off 1/3rd of the dough with serrated knife, or a bench knife, for each loaf. Using just enough flour to keep dough from sticking to work surface or to your fingers, gently and quickly shape dough into a ball OR oval shape, depending on the shape of the pot you are going to bake it in. Line a bowl, pan or oval casserole (depending, again, upon the shape of the vessel you will be baking the bread in-- doesn't matter what it's made from as you aren't going to bake it in this, just let it rise in the appropriate shape) with baking parchment -- 1 for each loaf you are baking at the time. 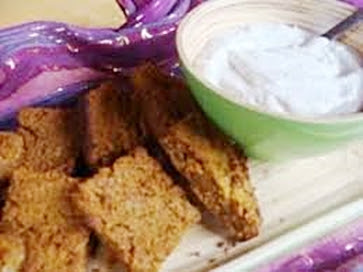 Sprinkle the parchment with flour, cornmeal, semolina, or bran. Place the dough seam-side-down on the parchment in the bowl or pot, and dust lightly with more flour, semolina, bran, or cornmeal. Place the vessel(s) inside of a clean plastic bag(s) (a small new white garbage bag does fine), and twist-tie closed, leaving plenty of room for the dough to rise. Let dough rise in a warm spot for about 2 hours (if dough has been refrigerated-- if it has not, rise at room temperature for about 1 hour). Heat the oven to 475°F, with the pot(s) you are baking the bread in heating in the oven at the same time, for at least 30 minutes. Use a deep cast iron skillet or Dutch oven with a lid (can be enamel-coated or not), or a heavy ceramic covered casserole (NOT unglazed clay). 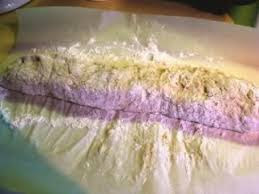 When the oven and the pan are heated, and the dough has risen for the appropriate time, just lift up the loaf (or loaves) right in the parchment (using the parchment as a "lifter") and set it into your hot pot, pan or casserole with the parchment. (Don't worry-- it won't stick or burn!) Cover with the lid and bake 30 minutes, then remove the lid and bake another 15 minutes, or until the loaf is beautifully browned. Remove the bread from the pan immediately and cool on a rack. PS: If this method of transferring the loaves to the pots in parchment makes too much of a "neat and tidy-looking" loaf for your taste, follow my original directions at this blog post (using the recipe in the blog post, not the printable recipe). This results in a more rustic-looking loaf as the photo below shows. It's up to you! Nutrition (per slice [12 slices per loaf]): 100.1 calories; 10% calories from fat; 1.2g total fat; 0.0mg cholesterol; 189.9mg sodium; 89.0mg potassium; 19.5g carbohydrates; 2.5g fiber; 0.8g sugar; 17.0g net carbs; 3.8g protein; 1.6 points. UPDATE (Jan. 16, 2010): This afternoon I used the remaining dough (2/3rds of the recipe) to make 3 pizzas. This was the best almost-all-whole-wheat pizza I've ever made! Even my 3 picky granddaughters loved it! I used it cold straight from the refrigerator, with no rising, baked it at 500 degrees F. I just patted and stretched the dough out by hand on a sheet of baking parchment-- it's a sticky dough and you can't spin this one! I baked it right on the parchment because I was afraid the sticky dough would stick to the peel. It worked just fine! I made the pizza pretty thin, but you can see that the edges puffed up quite a bit in the oven. 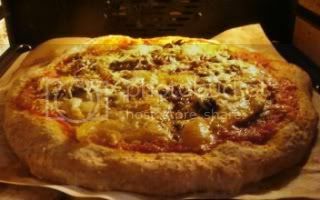 Pizza made with the same dough, after refrigerating it for 3 days.